KIEV, Ukraine -- Sergey, a 23-year-old Ukrainian soldier, is resting in a drab, grey, Soviet-era military hospital on the outskirts of Kiev. Inside a military hospital in Kiev, Canadian-backed doctors are fighting to save battle-scarred soldiers. Sergey (who asked that his last name not be used for privacy reasons) suffered massive head trauma during a fight that occurred just outside the enemy stronghold of Luhansk. The fighting took place after the signing in February of the Minsk II ceasefire, which is still in place, in theory, but completely dead in practice. Politicians cling to the hope that the ceasefire will still somehow work out, but soldiers in eastern Ukraine laugh when the subject is brought up. The fighting has continued daily in recent months. He rarely looks up while speaking and, when he does, he stares past everyone. The young soldier was mobilized and thrust into a war he’d never anticipated. He has deep scars now, both physical and mental. Nevertheless, he is anxious to return to his unit once he has recovered at the Irpin military hospital. He says it’s wrong for him to rest while they fight. The intensity of the battles in eastern Ukraine is heating up once again. Just days before Prime Minister Stephen Harper arrived in Kiev to meet President Petro Poroshenko on June 6, Ukrainian forces fought off the largest assault against their positions since the fall of Debaltseve in February. While the situation on the front lines appears to be worsening, so is another, quieter problem: how to treat the thousands of wounded and traumatized soldiers like Sergey, who have come back from the front. This is one area where support from Canada—both from private sources and government—is proving essential. “We forgot how war affects people after Afghanistan,” says Dr. Vsevolod Stebliuk, a Ukrainian military doctor, referring to the Soviet invasion of that country in the 1980s. The lack of experience is not the only problem. Soldiers lucky enough to return home alive from the war often find that Ukraine’s endless battle against corruption means their government, even if willing, has been left unable to support them. The health system is notoriously corrupt. Although the system is meant to be free, soldiers say that often the only way to obtain services is to pay bribes, while funds allotted for certain services routinely go missing. The sophisticated physical and psychological therapy provided to soldiers in the West is not an option for Ukraine’s soldiers. Ukrainian Canadians have taken the lead in creating rehabilitation programs that help soldiers recover from the horrors of war. Sergey is one of the first soldiers admitted to the Irpin military hospital’s new centre for psychological and physical therapy. Taking up an entire floor of the hospital, the centre was funded by the Guardian Angels Ukraine project. Canadian Lisa Shymko, the project’s chair, says the idea came about after she visited a group of wounded soldiers at one of Ukraine’s military hospitals. The project was launched in December 2014 in Toronto and raised more than $125,000 in its first month of fundraising. The project flew Stebliuk to Canada to learn at the St. John’s Rehab centre, part of the Sunnybrook Health Sciences Centre. Now, as head of the rehab program at Irpin, Stebliuk is trying to put those techniques to use, but without psychologists trained to treat combat-related psychological problems, he faces a tremendous uphill battle. “The main challenges [for the soldiers] are acquiring a new meaning of life and integrating into peaceful life, because it’s equally hard to adapt to war and, later, to adapt to peace,” he says. While the Guardian Angels Ukraine project tackles psychological trauma, another critical problem in Ukraine is the loss of limbs. The Second World War-esque artillery barrages characteristic of this war have led to an enormous number of amputees. The razor-sharp shrapnel from bombardments is capable of splitting trees in half. Any soldier caught in the open stands little chance. Those who escape face a future in a country without the proper resources to provide prosthetics. More than 400 soldiers so far have been left armless or legless. Antonina Kumka, of the Ukrainian Canadian Congress’s Toronto branch, is the lead organizer of a program delivering prosthetic limbs to amputees. Kumka says the goal is not just to provide prosthetic limbs, but also to teach Ukrainian specialists how Canadian and American specialists build and fit prosthetic limbs. For that, they flew in specialists from North America, as well as prosthetists from across Ukraine to work together in a clinic in Kiev for 10 days. The goal was to provide new limbs for five soldiers that week, but, more important, to establish the foundation for long-term success by transferring the North Americans’ experience to their Ukrainian counterparts. The goal is to build a self-sustaining prosthetic industry in Ukraine, because there’s no telling when the war will end. Even when it does, the impact of land mines and unexploded ordnance will surely lead to a growing number of amputees in the future. One of the largest groups of Canadians in Ukraine is a unit of doctors and nurses who began flying in shortly after the 2014 Maidan revolution in Kiev, which ousted the pro-Russian administration of president Victor Yanukovych. He eventually fled the country, but not without leaving a trail of blood behind. Police on the ground, and government snipers firing from buildings, killed and maimed hundreds of protesters. Many were left horribly disfigured, with no options for recovery. 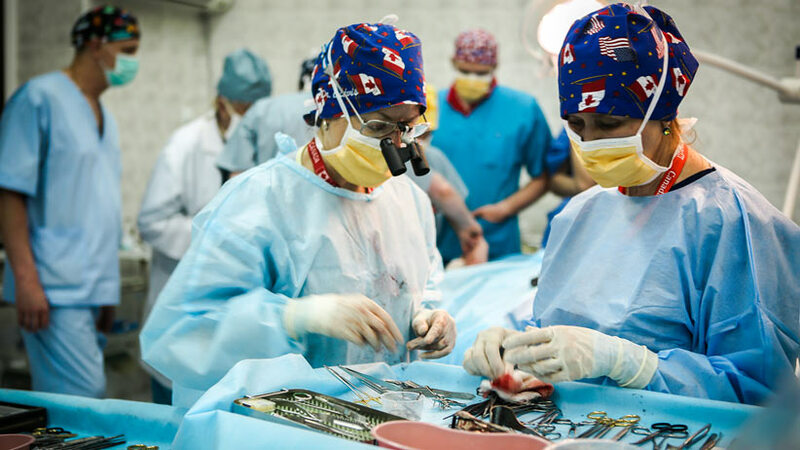 Thus the medical mission was established to perform the sorts of complicated post-traumatic reconstructive surgeries that are simply impossible to obtain in Ukraine. Many were surgeries that dealt with extensive facial reconstruction resulting from gunshot wounds. The project is the initiative of the Canada Ukraine Foundation and headed by Krystina Waler and Dr. Oleh Antonyshyn, a surgeon at Sunnybrook Health Sciences Centre. At a fundraising event in September 2014, with Harper and Wayne Gretzky as keynote speakers, they raised $250,000. Antonyshyn then reached out to Canadian medical supplier Stryker Canada and asked to borrow some badly needed equipment. “Part of the goal was to establish an infrastructure whereby Ukrainian doctors could continue to treat patients in the future. We’re now able to do that, because Stryker just donated the equipment outright,” says Antonyshyn. His team of 25 Canadians was able to complete 37 procedures in one week during the first medical mission in November 2014. The second mission in May 2015 resulted in 58 procedures on 28 patients in just five days. Waler says the team was fortunate to have the Canadian government allot them $1.2 million out of a recently announced $14-million humanitarian aid package. With the latest trip costing around $125,000, the team should be capable of repeating its mission 10 times, operating on around 300 people. Many in Ukraine, including President Poroshenko, hope Canada will send lethal military aid to help in what has been a losing battle against Russian aggression. Harper, so far, has agreed to send 200 military trainers. The medical contributions, meanwhile, are doing their part.